We pilfer quite the same loot from a sovereign God when we give ourselves no say-so as when we give ourselves any at all. I do sit around and ponder things such as this, but with discretion that I recall rarely demonstrating in a younger me. It is yet decided by the hounds which me is the more profitable. A person can only read but so much before recognizing that there are valid arguments stemming from both ends of an irreconcilably divided library. One defense utilizes an array of verses and the other responds with a selection au contraire. There is something, probably much, of this faith that remains a mystery still, and we will not be unwise to plod on with with our inquiries, but to do so with bitter animosity and dogmatic anger on behalf of one pole or the other seems to demonstrate a denial of reality, that two thousand years of squabble has yet to resolve the matter. 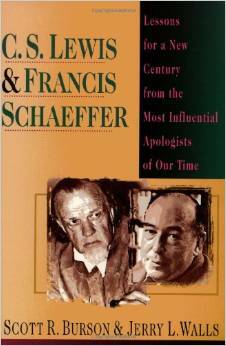 This entry was posted in Lewis & Schaeffer and tagged Christianity, cs lewis, election and freewill, faith, Francis Schaeffer, inspiration. Bookmark the permalink. Maybe we need to hear the voice of The Lord say, “What is that to thee, follow thou me.” I hope I am moving further up…further in. Closer to the center. Read another way in another time, I used to think, wow, Jesus was really short with Peter here, almost snarky. Rather, as you speak so well, His were words of gracious wisdom and love, “Don’t forfeit the time you can spend with me and mine trying to dig deeper than I’ve provided tooling for.” Not neglecting the gift of the Word, to study and with a lot of grace learn WHO unites us; Jesus. Lewis was and is a true gem! We know one thing for certain, He will never turn away any that call upon Him for salvation. Very well then my friend, very well. Indeed. They never had this problem in the first century, as least not among the Lord Jesus, the first apostles, and the first generation early community. It was a much, much later aberration. Therefore, I think the best way to handle the brontosaurus in the cathedral is to go back to that wonderful time before cathedrals (or any church buildings of any stripe that lasted for three centuries and still causes most Christians to flat out reject such a historical truth because it just does not compute against later anti-historical renderings) and try to see what later became a problem from the perspective of those who had not the problem. And this must be an individual quest because the Lord might turn someone on to a truth that does not compute, which the purveyors of keeping everyone on the same page (their page) have a serious issue with regarding perceived straying sheep or what others may call leaving the reservation and violating a family code of honor by joining the other side or much, much worse, joining the Lord’s side. For serious students that will not be denied, the answer is in the pure teachings of the Lord Jesus and not in the pronouncements of any other, with all due respect to any and all others. That is where we must go and that is where we must stay until the great Light dawns to a new day. Good stuff to think on you bring RJ… evocative even. I’ll withhold thoughts on a question for you until mentioning a couple things of interest in concerning the infant church. First, even in the Ante-Nicene era of church history, we have preserved texts speaking and writing of predestination, freewill, election, etc., but in nearly every case, each side of this argument can find statements made to defend each stance. It seems the early Christians had no problem believing God could be both the chooser and the chosen, or at least, by their own testimonies, while sovereign, still placing the decision in the hearts of the called. You are very right though to share these arguments did not arise until some time around the Augustinian writings (400 or so), by the resources I can find anyway. What is interesting to me is that this friction rarely seems to rise up in communities where the persecution and poverty levels are high. Probably explains a lot of why until 400 or so, it was a non-issue. It is almost as if when the Christian life is too easy, we run to nonessential stuff to spend our time, in turn, neglecting what means most to God, our love for Him and one another. Then the question: It appears you are convinced the local assemblies have all become corrupt? That the true church cannot seek to worship there anymore? That would really make an interesting conversation piece. Blessings my friend. Thanks Mike, for your reply. I appreciate men who are willing to take on tough topics with grace. It appears very clear, though, that you have already answered your question to me regarding my take on local assemblies. I certainly do not believe all local assemblies are corrupt, only the majority. And this is obvious in an America where the salt and light content has proven to be seriously deficient with regard to the ongoing anti-Lord Jesus culture. It is all the more remarkable that America has the greatest of all Christian heritages and that the majority still claims Christianity. But the point you made about persecution and poverty rings true. Therefore, an American Christianity loaded down with Laodicean riches has certainly curtailed the effectiveness of the Lord’s one Gospel and Truth, and real Christian unity has suffered. The reason there was great persecution and poverty and the subsequent greater love and unity of believers in former times was BECAUSE they demonstrated and possessed great salt and light, and the sinful cosmos of mankind fought back. In America, Christians are not fighting back properly, and not yet from a spiritual starting point as a majority. American Christianity in general has made peace with prosperity and abhors any form of persecution. Yet, a Great Awakening is still on the way because more and more are getting the big idea. In that light I want to reiterate that joining together in a static building, which has become the norm, does not necessarily snuff out the process for turning things around. But there are many things associated with said joining that does. Again, this must be construed as obvious given the state of our culture. We American Christians are doing massive amounts of work and are extremely busy, but with relatively low effectiveness quotients. I believe the Lord may say to us at the judgment something to the effect, “Why didn’t you work to change your country? And why didn’t you do it the way I told you to?” These are sobering words. If the early believers turned the world upside down and overcame the Roman Empire, American Christians can certainly be more effective. We MUST be more responsible and see beyond our local assemblies, some of which certainly have their hearts in the right place and do good work. But because so many local assemblies refuse to budge, the Lord has often been forced to leave the building to reach the lost. Bless you, my friend. Thank you for the opportunity to post. The truth of the matter when it comes to election and free will that both are clear in Scripture. We are elected and we have free will. While that doesn’t track with us that has more to do with our limited understanding of reality than anything else. If time and eternity can stand side by side why is it so odd that election and free will should do the same? Excellent thought Pastor J. We live with no means of being able to fully explain a Triune God. Some things Scripture teaches is as you say, beyond our limited understanding. We plod on. Great to hear from you our friend.